This luxury contemporary villa in Garajau, designed and equipped to the highest specification, sits on the cliff edge and will appeal to the most discerning client. Unparalleled views of the Atlantic Ocean and Funchal, spacious and with elevator and central air-conditioning it is only a 5 minute walk to a number of excellent restaurants, bars and cafes, fruit and vegetable shop and branded supermarkets. A truly great choice for villas in Madeira, in a superb location, only a 10 minute drive away from Funchal. The huge open plan living/dining with double height ceiling with two seating areas, L-shaped sofas and comfortable armchairs, bar, 8-seat dining tahble and wall to wall glass opens out onto the south facing terrace where you will find the swimming pool and outdoor seating and dining. There is a bar area and feature fireplace with seating area beyond. The south facing solarium is certainly the place of choice to spend your days, being private and featuring outdoor furniture and dining and direct view over the sea. The luxuriously equipped kitchen has everything you could want including a breakfast table and alos leads to the pool deck. All four bedrooms are on the first floor (two with en-suites), and all are air-conditioned. The Master bedroom is particularly spacious and includes an additonal seating/dressing area. The games room with PlayStation 4 is also on this level. Fully equipped kitchen. 4-ring electric induction cooker, built-in electric oven, microwave, American style fridge/freezer, dishwasher, Dolce Gusto coffee machine, kettle, toaster, juicer, hand held liquidizer, breakfast table. Patio doors to pool deck. Double height ceiling, two sitting areas, cable flat-screen cable TV, DVD, portable Bluetooth speaker, central air-conditioning/heating, sea-view, opens to pool deck. There is a separate games room with TV and Playstation, leather sofas and beanbags to chill out and a double sofa bed, suited to 1 adult or 2 children. South facing deck with freshwater swimming pool, sunbeds, sun umbrella, outdoor dining table for 8, portable barbecue and rattan 3-piece suite with sun umbrella. Pool heating is optional and costs 120,00€ per week for 24ºC, paid in cash on arrival. Storeroom with washing machine, iron and ironing board. There is free Wi-Fi connection throughout the living area. There is secure parking facilities for up to 1 car. A car is not essential if you simply want a relaxing holiday with good restaurants and a large supermarket within a 5 minute walk. There is a bus stop close to the villa and great taxi services if you want to go to Funchal for shopping or for boat trips from the Port. A security deposit of 300€ is required by credit card at check in. Please ensure you have a valid credit card with you. If you do not have a credit card then the deposit must be paid in cash at check in. 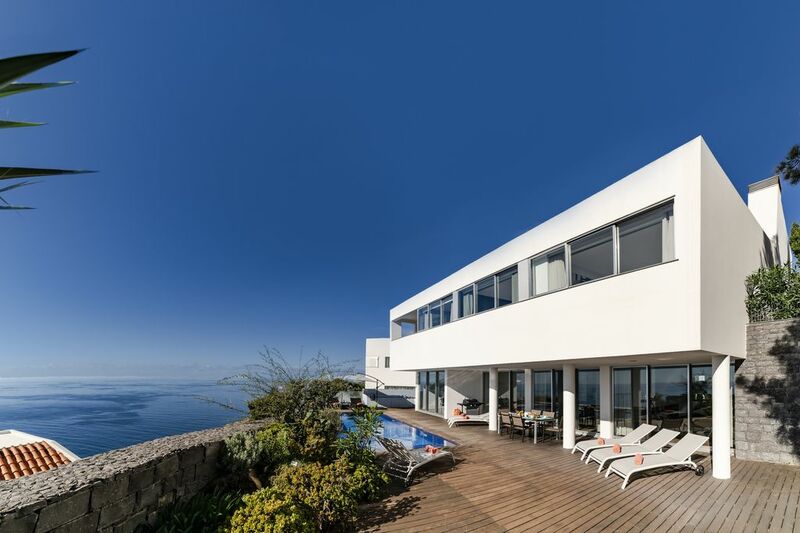 Wow, the panoramic views over the Atlantic Ocean from this villa hit you from the second you walk through the front door and gaze through the 5m long panoramic window on the top floor. They are also just as good from the middle level where the bedrooms are and from the lower level where you reach the kitchen and vast sitting room, which then open out onto a large deck and garden with the pool which also looks out over the vast Atlantic. The villa is incredibly spacious and every room is large and well proportioned. It is situated on the South Coast of the island on the edge of the capital Funchal, with stunning unrestricted 180 degree views to the South from 250 m above the ocean as the villa is positioned at the top of a cliff in the upmarket Funchal suburb of Canico. We never tired of the views, whether it was opening the curtains in the morning, sitting in the pool or gazing at the stars over the ocean at night. The villa is incredibly spacious as I have said above and very well appointed, including having a lift to take you up and down the three floors if you don't want to use the stairs. The main bedroom has a dressing room and balcony, again with the same stunning views. There is everything you need to have a relaxing and thoroughly enjoyable holiday, as we did. I would highly recommend this villa as to anyone wanting to stay in self catering accommodation in Madeira, it is only 15 minutes from the airport, it has good bars, shops and restaurants within close walking distance, but it is also is close to the centre of Funchal. The villa itself is of a very high standard and is very well equipped, as well as being very large and air conditioned throughout. The views though are incredible from every level and made our stay very special indeed. We have stayed in some stunning places all over the world, but this is at the top of the list in terms of everything it offers and the views rival anywhere we have been. Delighted that you loved the villa. Thank you very much for taking the time to post your comments - especially helpful for new guests. We hope to welcome you back again in the future. We are a group of 7 people from Germany and lived in the Villa Fonte do Mar for a week. It's a Great Villa with a stunning ocean view in a beautiful and calm neighborhood. We were also impressed by the scale of the house. 3 floors, a big “loft like” living room and a private elevator are features you don't find every day. Linda welcomed us at the Villa when we arrived and showed us around. She's a lovely person and very dedicated to make your stay the best experience possible. Thanks again to her for making us feel “at home” instantly. The pictures on the website are pretty much on point and resemble the Villa perfectly. It offers more then enough space for a luxury stay with up to 8 people. In the outside areas there is maybe some room for improvements such as the plants around the Villa that might need some more care or the upper balcony which might need a small paint job. But that's really nitpicking and shouldn’t distract from the overall great experience. So if you are looking for a great relaxing stay with a small group… don’t look any further. You just found one of the greatest options in Madeira. Thank you Thomas for your great comments. As explained when you arrived, we had just taken over the management of the villa, and it was a work in progress to smarten up the house. The garden has now been totally upgraded and we have new garden furniture. You have to come back and visit!